Each letter below corresponds with a point on the Hydro Ciser drawing above. Filters, heater, hydraulic drive over shallow reservoir tank. Control console by horse's head. Heart rate monitor and diagnostics by others. Exercise stall fills with 46" of water. 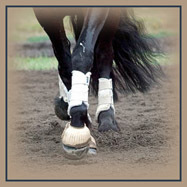 Buoyancy reduces concussive stresses by 40% and eliminates lameness. Water's resistance ensures high heart rate workout. Whirlpool jets and warm water give therapeutic massage. Quick-action door. Water pressure seals shut. Rollerless treadmill for low maintenance. Flat surface avoids jarring and lameness. Tones correct muscles. Strengthens legs. Year-round all-weather conditioning. Compact 13'L X 13' W X 4'H (also available in 5ft hieght) fits in any barn. Ground-level entry. Stall shaped like trailer and dry when entered. Horses enter readily. Uses readily available 208 or 220V, 100 amp, single phase power supply. The HydroCiser is HydroHorse Inc.’s latest product. 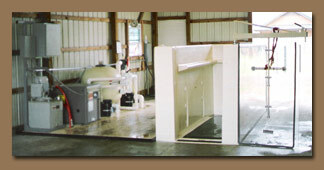 It is a ground level version of our very popular horse treadmill systems. It provides many of the benefits of the in-ground systems but in a much smaller package. We now have the option of adding a water chiller to the HydroCiser to aid in recovery efforts. Contact Us for more information about the water chiller feature. Horse entry to the ground-level tank is through a water-tight door. It loads just like standard horse trailer, so that your horses will have no problems getting in. 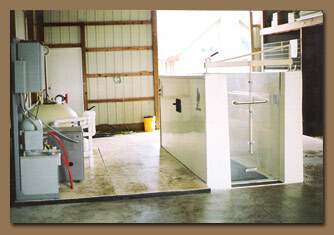 It is also a dry loading treadmill, water is only introduced after the horse is in and the water-tight door is closed. HydroCiser provides the means of far less traumatic competitive conditioning of race horses as compared to conventional "on-track" conditioning. The buoyant effect of water with the increased resistance to limb movement in water, combines to offer less concussive force to the limbs, therefore increasing muscle tone and minimizing injury. 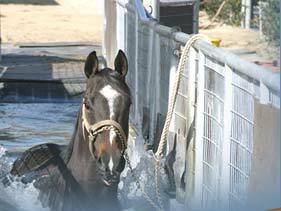 Until now, swimming horses for exercise has involved a series of "up-hill" limb thrusts - which in many instances could cause harm to the animal as the legs perform an unnatural all-out type of flexation. It is difficult if not impossible, to cause the horse to slow walk, fast walk, trot, etc., in a river or pool. To date, trainers could not truly control aquatic exercise with any satisfactory results. The HydroCiser has built into it the best features and advantages of treadmills, swimming pools, whirlpools, all combined in one small, compact unit. 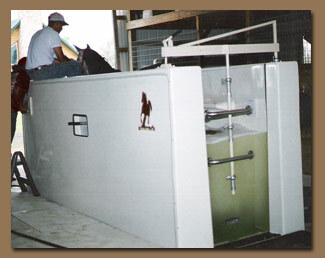 So, if you are looking for an all weather conditioning method, a therapeutic means to get injured horses back into conditioning more quickly, or a training method that minimizes injury, you will find all three, and more, in the HydroCiser. *NOTE - Price does not include 13'X13' concrete pit. Terms: 50% Deposit with order balance prior to shipping or on delivery. Six Month warranty on all parts with exception of treadmill belt and rubber hose, which is guaranteed for 90 days from the date of installation. Please Contact Us for current pricing, specials, and options. Installation includes setting of stall, final hookup of services, and training for running the unit. Purchaser responsible for any necessary concrete work, for appropriate permits, state and local taxes, shipping, per mile destination charge, any building or site modifications necessary for installation, and service stubs to within 6 feet of installation. 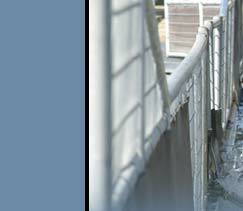 If desired, HydroHorse Inc. will provide necessary concrete work at additional cost. Custom concrete Hydrocisers are also available, Contact Us for details.